BendPak MDS-6LP Open Center Mid-Rise Scissors Lift 6,000 lb. When it’s time to add some much needed versatility and productivity to your professional shop or home garage, your first stop should always be a BendPak car lift. Our 6,000-lb. capacity mid-rise scissor lifts are designed to fit nicely into narrower bays and won’t take up much of your precious floor space. Thanks to the small footprints, even shops that don’t suffer from small work areas will benefit from their ability to be placed just about anywhere without getting in the way. These state-of-the-art scissor car lifts come well-equipped with adjustable arm assemblies and an all-important multi-position safety lock bar to give your lifting jobs the dynamic flexibility necessary for the best possible result. Easily and reliably adjust your lift to any secure position. The true benefit of the mid-rise lift series, however, is their portability. Since they are designed specifically to engage a vehicle’s frame, the mid-rise lifts offer users a seamless lifting experience, regardless of whether you’re servicing cars or light trucks. You can always trust BendPak for increased durability, safety and productivity. Comparable quality or value cannot be found anywhere else—whether you need two-post car lifts, four-post car lifts or space-saving scissor lifts, BendPak’s best always beats the rest. All BendPak mid-rise scissor car lifts come with a free set of truck adapters. It’s just another way that BendPak maximizes your garage's full potential. We’re not just talking a big game; we’re offering the only true open-center mid-rise car lift in the world. Our competition leaves obstructing cross bars on their designs they claim to be open-center, so we’re confused by the trickery of their marketing. If it’s completely open-center, it must be a BendPak MDS-6 series car lift. Our EXT mid-rise scissor lift models offer super-extended lift points for EV vehicles (e.g., Tesla). These lifts are going to be used more and more as the markets increase production of electric vehicle types. Most EV vehicles have extended lift points and require special care when lifting, so make sure your shop can accommodate them. Years of experience have taught us a thing or two about vehicle lift points. We’re being modest: we’re the industry experts in car lifts and vehicle maintenance. A car lift with longer platforms means you get to lift more vehicle types than ever, correctly. The “correct” part is key. Too many well-meaning shops risk personal safety and the well-being of the vehicles they work on, because their lifts don’t reach OEM jack points. The redesigned MDS-6 aims to correct that problem once and for all with longer platforms for an extended lifting point spread. Converting your low-rise lift to a flush-mount design is now easier than ever. The ramps attach directly to the platform, so converting your MDS-6 series features ramps attached to the base frame. This makes it easy to work on elevated vehicles, especially in the wheel well area. The approach ramps have slotted receivers and simply drop into place. They can be easily removed by lifting upward. Car lifts in the MDS-6 series have a pivoting “kicker” mechanism that helps lift low ground-clearance vehicles. Scissor lifts in general have poor mechanical advantage when fully lowered. They have no lifting force until the frame rises a few inches. It’s like having booster rockets for the first six inches of upward movement. Four support bars make for the strongest mid-rise lifts in their class. Whether you’re looking for just wheel and brake service, open-access to your vehicle’s undercarriage or a flush-mount design, we have that lift frame that’s right for you. A hydraulic cylinder with built-in flow divider ensures a safe, even lift and descent with every use. This is important, especially on mid-rise lifts where the frames are separate, because it would otherwise be impossible to get a perfect lift each time. 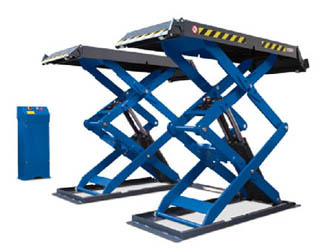 Even single-platform lifts require an equal balance of pressure to prevent vehicle tipping and ensure pressure is evenly applied by the vehicle across the lift platform. Safety arms engage automatically during ascent, a crucial safety feature that essentially makes lift failure impossible. The safety arms are over-engineered withstand unlikely worst-case emergency situations. Even if you lose complete hydraulic fluid pressure due to a leak or hose rupture, the safety arms won’t budge an inch. Rather than fit our mid-rise lifts with spring releases, we’ve installed lighter air cylinders that simultaneously release the safety locks during descent with a simple push of a button. (NOTE: Requires min. 50 PSI, 10-CFM air source at time of installation.) The cylinders are easy to maintain and provide an absolutely safe and controlled descent with each use. The operator controls are located away from the lift and allow safe deactivation of the locks without the need to push or pull cumbersome release bars or lock release handles. The lift functionality is already perfected by our engineers, so for your convenience, all you need to down is press the button, and your car lift fully descends in seconds flat. We couldn’t have made it any easier. Our Zerk fittings feed lubrication at critical wear areas, which is essential for not only the longevity of your lift, but the low-maintenance guarantee that we built our reputation on. Our mid-rise lifts don’t need much service for the many years you will own them. Durable rubber blocks come standard with our mid-rise car lifts. They’re not like the rubber blocks and flimsy rubber pads you’re accustomed to seeing: these blocks are robust, textured for better hold and safe to use on virtually every vehicle type. Three lock positions give technicians greater versatility to work at different working heights. Whether you prefer to work lower on a floor creeper or lean back on a mid-level shop seat. Plus, if you’re detailing or doing wheel service, the full extension may not be preferable. 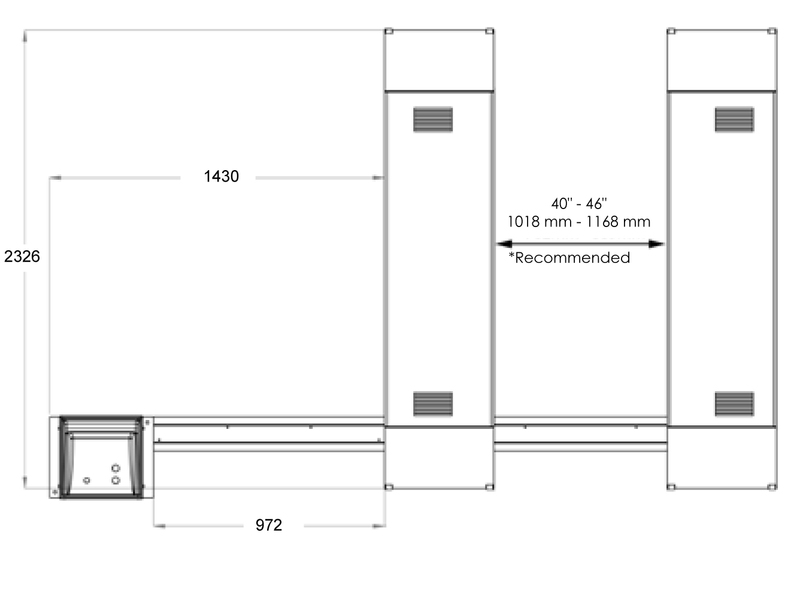 Whatever height you prefer, mid-rise lifts offer greater undercarriage access without sacrificing portability. Included with every lift are graphic safety decals, maintenance decals, vehicle lifting point guide and a safety instruction placard to train personnel on proper safety procedures and maintenance guidelines. We highly recommend you learn the safety features, warnings, do’s, don’ts, etc. FRONT-TO-BACK before installing or operating your mid-rise lift. BendPak’s 6,000‐pound capacity MDS‐6 model is open‐center, making it possible to fully service passenger cars, SUVs and light trucks. The exclusive open‐center design of the MDS‐6 not only allows full unobstructed access to the underside of the car, but is also clear of frame cross-members on the floor that are typical with other mid-rise lifts. This design, fully open both top and bottom, is the only truly open-center mid-rise lift in the industry. This makes the MDS-6 a clear leader in convenience and work productivity. It features wide lifting platforms combined with durable, cushioned rubber contact blocks. Simply drive the vehicle over the lowered scissor ramps and position the durable rubber blocks under the lifting points for fast and easy vehicle positioning and setup. If you’re looking to flush-mount your lift in the floor for a smooth sub-surface installation, be sure to choose the MDS-6LPF or MDS-EXTF. 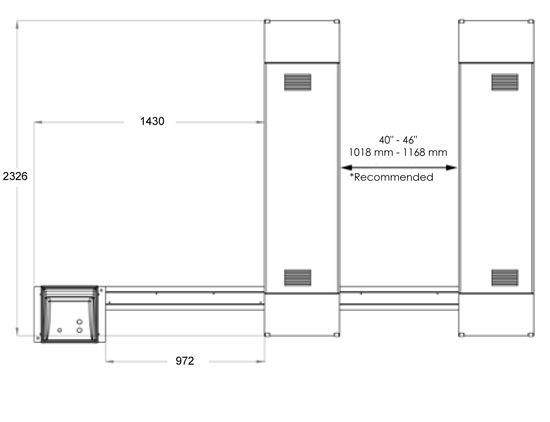 They feature all the same features of the MDS-6LP and MDS-6EXT but are more ideal if you want your lift to collapse perfectly parallel with your flooring. The next generation of electric vehicles has arrived, and it didn’t go unnoticed by us that the lifting points of these vehicles is very different. Using Tesla vehicles as our point of reference, we re-designed a specialty model of our mid-rise lift to accommodate longer lifting points that better reach the extreme edges of the vehicle underbody. These lifts maintain their open-center design and come in surface and flush-mount models, just like our standard MDS-6LP and MDS-6LPF models. *Special voltage available on request. Design, materials, and specifications shown here are subject to change without notice. Note: An air supply (minimum 50 psi / 10 CFM) is required for the safety-lock mechanisms to disengage. It is solely your responsibility to install and maintain the air supply. NOTE: Vehicle jacking points vary. Check your vehicle jacking point locations before committing to above measurements. Adjust platform width as desired. The rubber contact blocks should be positioned at the middle of the platforms during use for optimum performance. Each lift platform features four solid steel-scissor frame support bars making it the strongest mid-rise lift in its class. Dual master hydraulic cylinder combined with dual equalizing cylinders provides a safe and level 6,000 pound lifting capacity. Solid‐steel safety lock bars engage automatically during ascent. Convenient stainless‐steel pneumatic cylinders simultaneously release safety locks during descent with a simple push of a button. A push‐button safety lock release system is operated away from the lift and allows operators to safely deactivate the locks without the need to push or pull cumbersome release bars or lock release handles. Hinge point features Zerk grease fitting to allow lubrication at critical wear areas. Drive‐over ramps fold down during ascent and feature non‐marring wheels to protect garage floors. Comes standard with four durable cushioned‐rubber contact blocks providing fast vehicle set‐up. Non‐skid approach ramps help to prevent slipping during approach and vehicle positioning. Three locking positions allow technicians to work at different working heights to increase productivity and minimize fatigue. Powder coat finish provides a long lasting durable finish.